Summer Release Blog Blitz: Hello Layout!!!! This is a beautiful party!!!!!! Welcome to my post!!!!! It's so full of energy, good and beatiful energy!!!! Good Vibes!!!! (Dave, Good Vibes could't be a great phrase for a diecut jiji) First I painted my background with watercolors with energy and vibrant colors too!!!! That "Hello" is fantastic!!!! You can win it!!!! 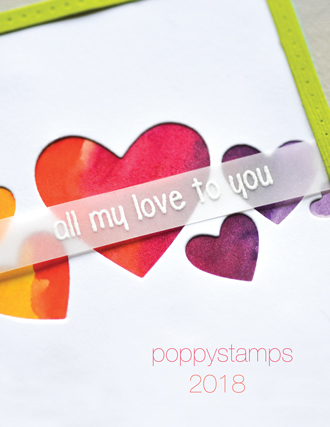 Love the size of these words, a great success of Poppystamps!!!!! My spanish quote means: Fly as high as your dreams take you! I write it! In my layout, you can see stars, butterflies, glitter, shines, golden things, elements that I love to put in my projects!!!!! ou can see me too! jajaja Hello!!!! 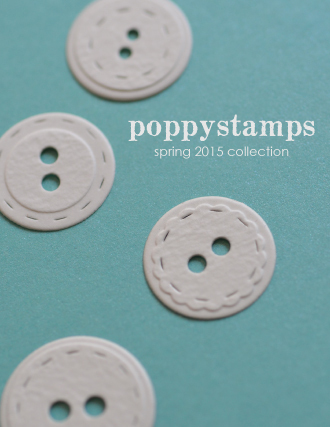 Remember: We're showing the newest Poppystamps release and celebrating with a Blog Blitz! 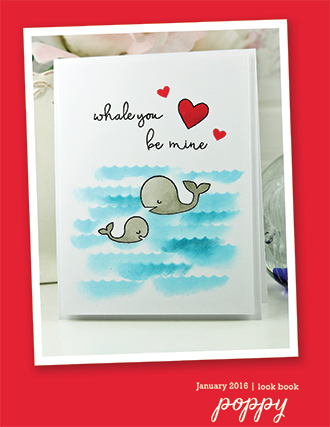 There are 16 new dies to show that we think you're going to love! Not familiar with our Blog Blitz? Well .. it's a special time we set aside to show the new products.. and the best part? You'll find a prize on every post during the blitz! 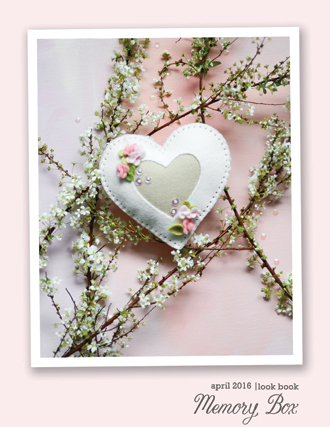 The prize on this post is the Hello Folksy Scrip!!!! Comment!!!!!! I love read you!!!! 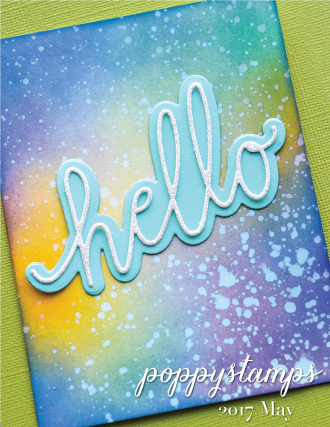 Hello crafty friends and welcome to another day of Poppystamps Blog Blitz featuring Summer 2018 release! All you have to do for a chance to win is to leave a comment down below by July 4. Don't forget to visit other posts of Blog Blitz as each of them has a giveaway! 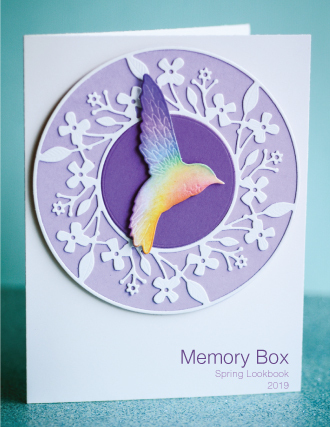 I have used this die as a focal image for a card that I've made. 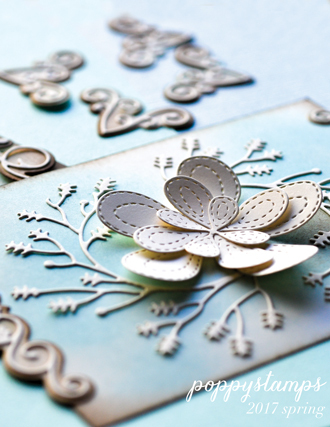 A project like this does not require a lot of other supplies but dies - some white and ivory cardstock plus a bit of vellum, one pad of Distress Ink and some liquid glue - that's all it takes! Scroll down for some close ups of the project as well as the beginning to end VIDEO tutorial! Thank you so much for stopping by and welcome back tomorrow for another day of Blog Blitz! Hello everyone, our blog blitz continues! 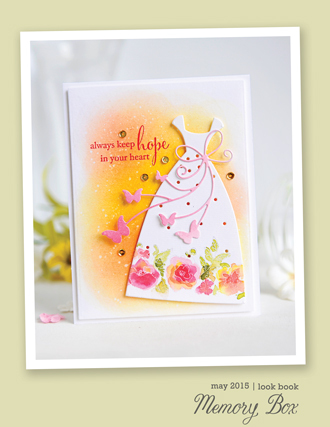 but not for long now, hope you have enjoyed seeing these beautiful samples using this new release by Poppystamp dies. Like a chance to win this Plumed Peacock just comment below! before or on 29th. The beautiful rainbow colours are from bits I had left, rainbow mirri sticky foil, think you can see the bits i had to play with!. 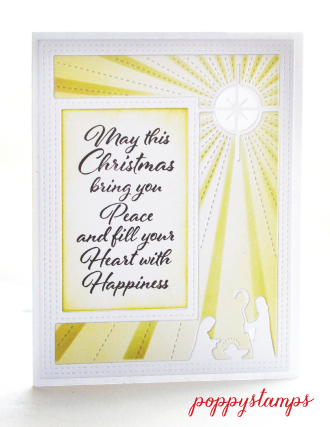 Did`nt work out to bad though..I have embossed this foil in my machine with the die, before laying the cut out die on top. I have used "Stitched Rectangle frames" & "Delicate Branch Collage" both from the new release, I have offset the smaller inner frame, as I wanted a larger lower border for my peacock plumes. Branches I coloured with a promarker pen. next 3d foam tape on the reverse, to add depth to the frame. Card size 7"x 5.1/2" ..adhere the frame as shown..Stamp the sentiment of choice, mine by Poppystamps from the "Flower Patch" set. Finished with touch`s of white from my gel pen, 3d foam to raise up the Peacock, around the frames liquid pearls. 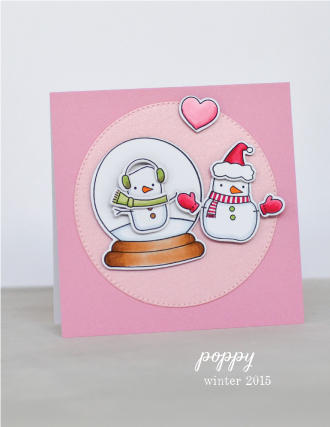 I hope you have seen the latest release from Poppystamps...no? Well here's the link to see all the new products Summer Release! 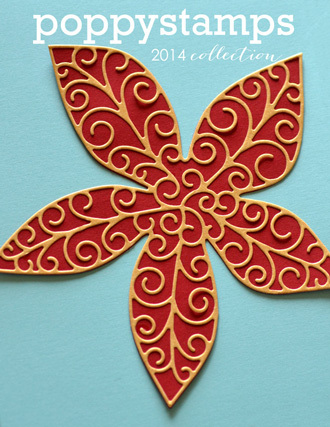 PLUS, you could win the Daisy Frame die from the Summer Release, more information at the end of my post! 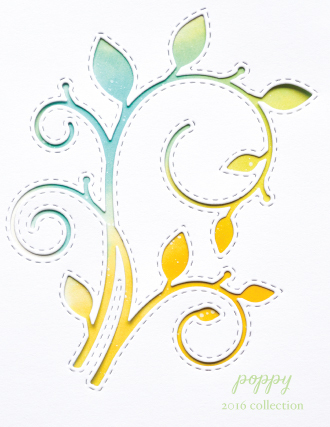 The pretty background die on my card is the Daisy Frame!! This die is 4" square and is very versatile! 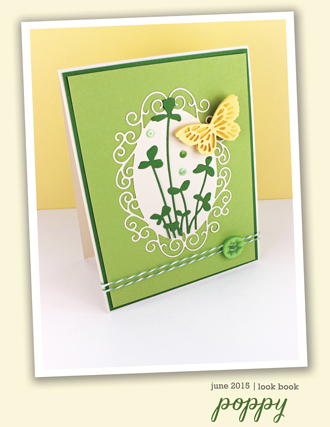 For this card I cut the Daisy Frame three times, yes I know, I do that a lot, BUT I love how it looks! 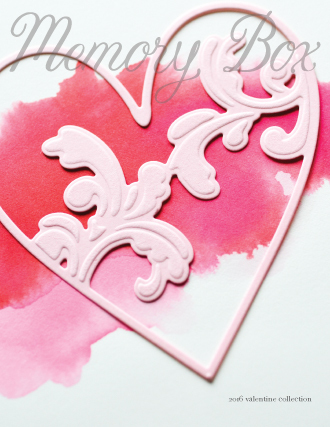 The dark grey cardstock I used was a nice compliment to the light pink cardstock. It's a nice contrast but much softer looking than black! 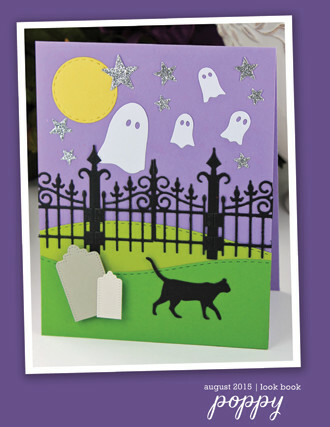 The following video will show you how to put this card together! 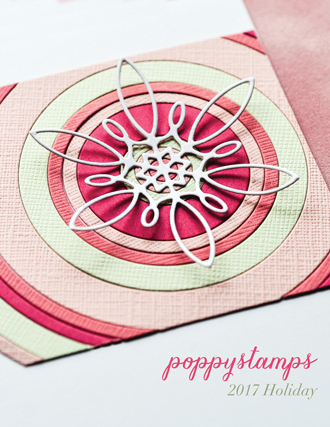 If you would like to win the Daisy Frame die, please leave a comment!! 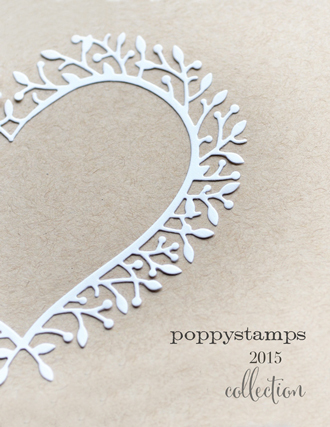 Here's all the important information about Poppystamps Summer Release Blog Blitz! 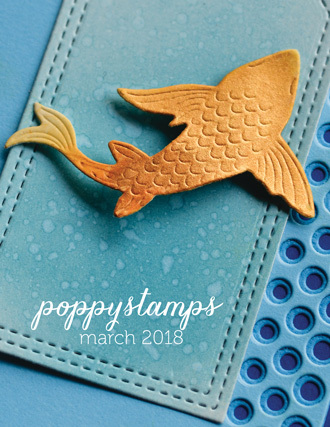 The blog blitz runs from June 19-29, 2018; Poppystamps is giving away a prize on every Blog Blitz post during this time. You must leave a comment on ONLY the posts you wish to enter. To enter ALL the posts during the Blog Blitz you need to leave a comment on EACH ONE. One person will be chosen at random from each of the posts during the blog blitz. 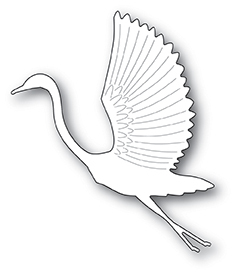 Only one prize per person per blog blitz. 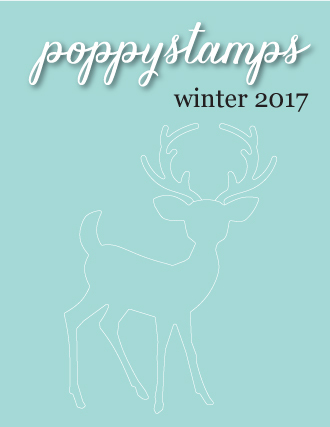 Poppystamps uses a random number generator to select winners from comments. You have until midnight US EST July 4 to leave a comment on each and every post you want to enter. 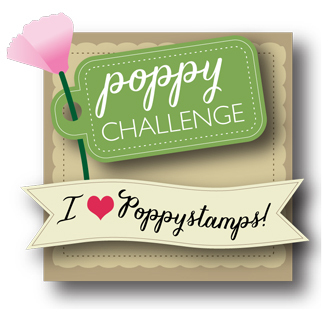 Winners will be announced on the Poppystamps blog on July 6. Good Luck and LEAVE a comment...please! Welcome back to another day of the summer Blog Blitz! Today you will have a chance to win the Large Lovely Koi die if you comment down below! I cut the Large Lovely Koi die from smooth, white cardstock and then colored it with several colors of Copic markers. If you don't have Copics, you could use any markers that blend well. 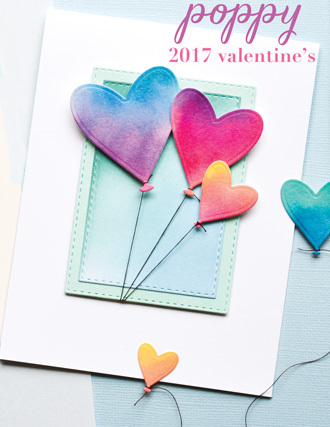 The idea is just to turn your white cardstock die cuts into colorful images with depth and dimension without doing any stamping! 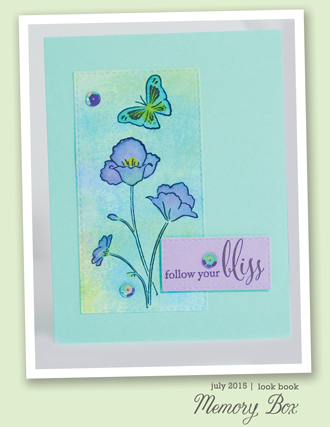 I used the same technique with the Folksy sentiment dies and love the gradient look you can achieve by using markers that blend over a die cut sentiment. 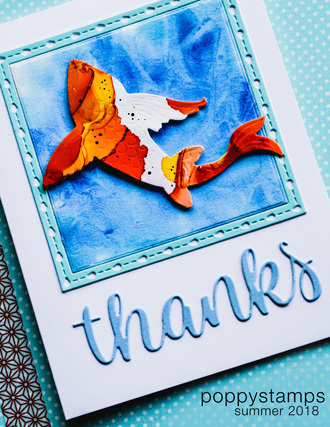 And don't forget to comment down below for your chance to win the Large Lovely Koi die, which goes well with just about any sentiment, don't you think? Hello! 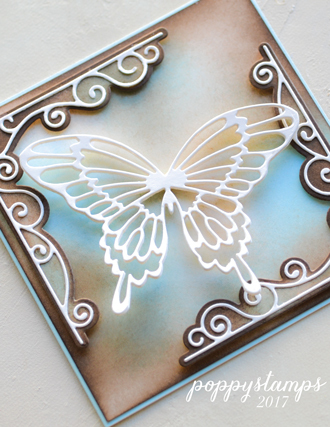 This new release is so much fun, and I love seeing all the new dies in beautiful creations! Today I'll be sharing a tutorial of this card in the video below. 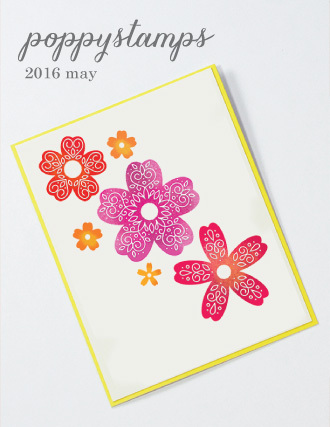 The Tall Sketch Daisies created a shadowed effect with white against kraft card stock. 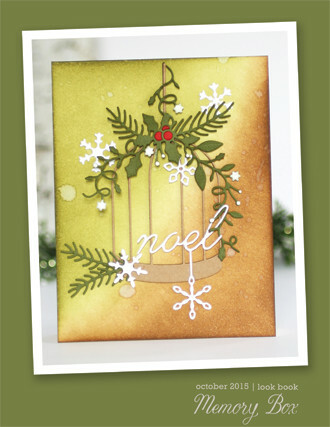 Along the way, I discovered a cool trick with using white-on-white that results in a beautiful, soft, cushy look. I'll show it in the video, but a hint: watercolor paper! 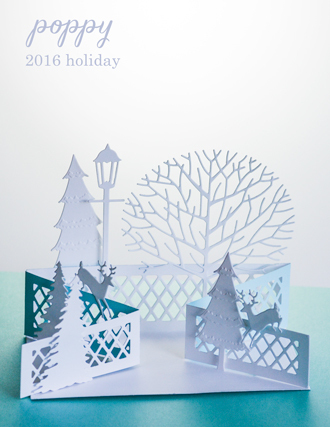 Just a few light colored crystals added a subtle sparkle and I love how simple this card is to make. Great for any occasion! 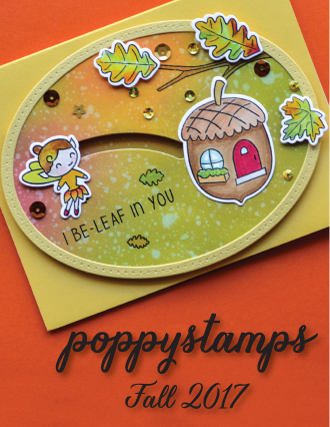 Thank you so much for joining the Poppystamps Blog Blitz today! 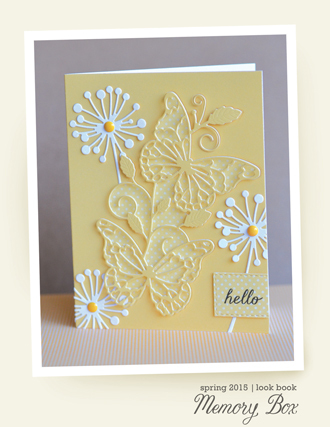 Guidelines are simple - Leave a comment on this post for your chance to win the Tall Sketch Daisies die set! Hi Everybody! 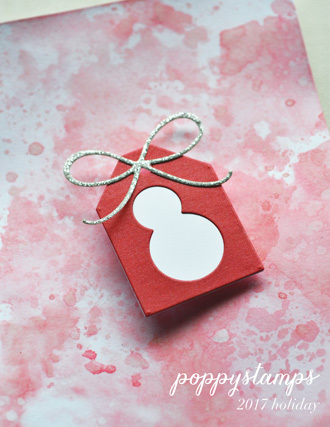 We're celebrating a Blog Blitz here at Poppystamps. And if you love the die I'm showcasing, LEAVE A COMMENT! 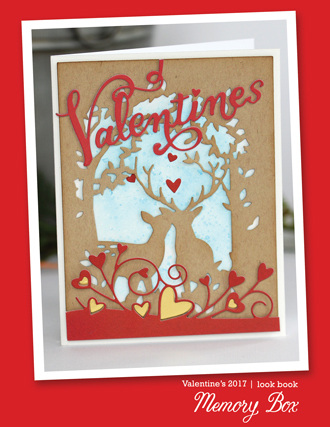 That's all you have to do, and you might win this darling Delicate Branch Collage die. Couldn't resist making it into a shaker. Like to make one similar? Here's a rundown of my how-to's. 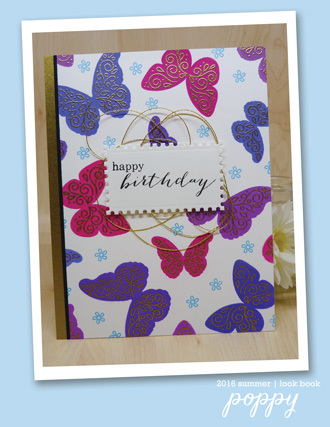 First I stenciled a card base with MB's Texture Dot Grid. I'm all about layers. And depth. and pattern. The more the merrier! 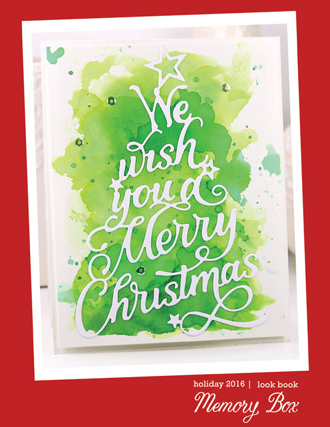 As you can see, I stenciled 3 shades of ink onto my card, not worrying about anything in the center, that part will be covered. I inked up a white linen look cardstock in blue and purple, before cutting out with my die. Also cut it again, so I could use just the branches. Notice I used my die with the branches on top. I knew I was going to add a sentiment on the bottom, so I wanted to keep the bottom clean. 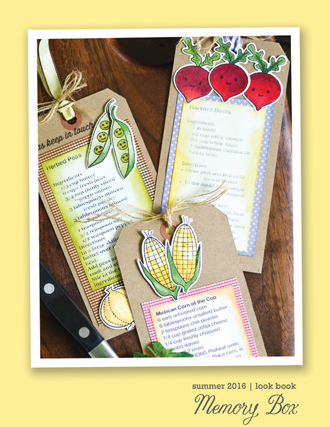 Friend Folksy Scrip is one of the new dies being released too. Stay tuned for one of the other designers featuring it as her giveaway. I cut my scrip die twice, once from navy blue cardstock, then from white. I love doubling up my dies, for added depth. Did I mention I LOVE layering? Couldn't resist adding a bit of Wink of Stella to my word die. 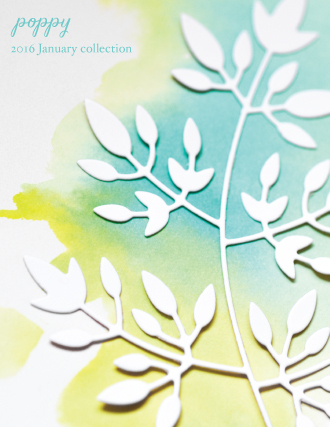 If you'd like a chance to win the Delicate Branch Collage die, remember to leave a comment. Someone's gonna win, hope it's you! 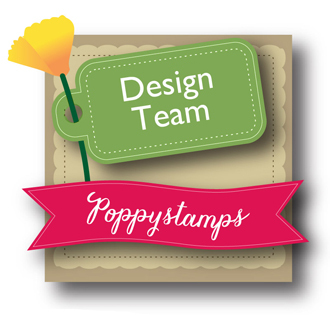 Hello and welcome to the Poppystamps Summer Blog Blitz! You have a chance to win this :Best Wishes die just by leaving a comment on this post. 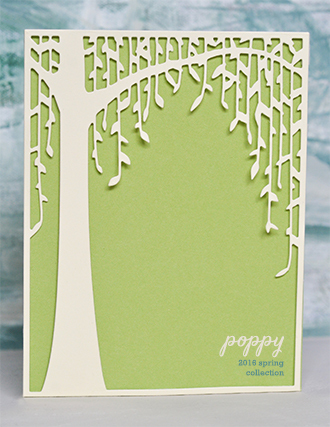 Poppystamps has many new dies that other designers will be showcasing. I diecut the word die out three times then glued each layer on top of the other . After placing where I wanted I added a bit of shimmer pen to make it pop. Something you can see in person better. 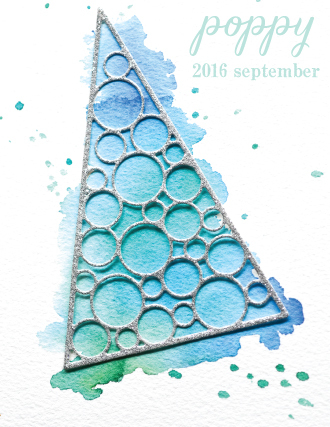 I cut apart the Finial Circle die , glued on the front panel and also used shimmer pen . I kept the first word die in place so it was easy to layer. I love the fun folksy font of this new word die. Thanks for the visit and thank you ahead of time for all the kind comments. So many chances to win. 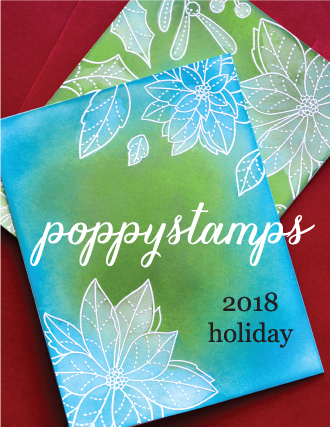 Don't forget to leave a comment for a chance to win "Best Wishes"
We are so thrilled you could join us today to help us celebrate our brand new Summer 2018 Poppystamps Release! 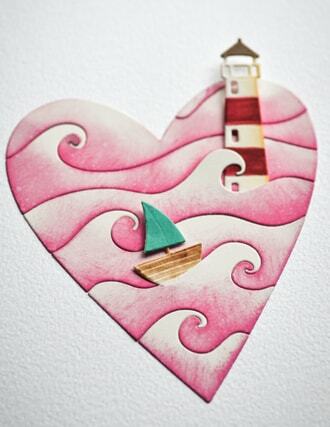 From June 19-29, our design team will be showcasing 16 brand new dies that you are going to love! You are going to love THIS too! You could win a prize on every single blog blitz post just by leaving a comment! 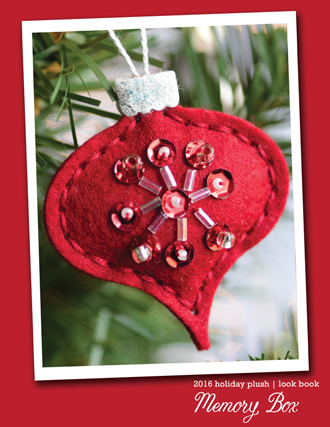 To enter to win, leave a comment on every post that features a die that you want to win! 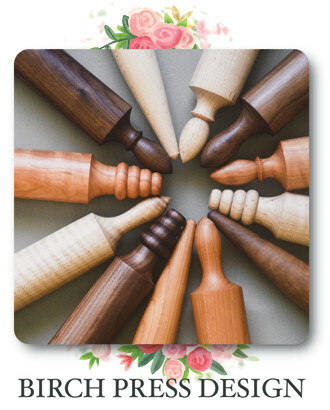 One person will be chosen at random from each of the posts during the blog blitz. You have until midnight US EST July 4 to leave a comment on each post. Winners will be announced on this blog July 6! 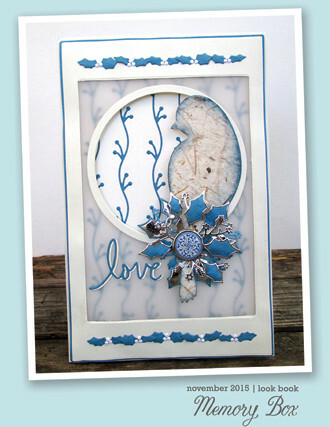 Today, I am showcasing this beautiful die, Perched Bird Collage! I made him in bright, tropical colors, perfect for upcoming tropical vacations and warm summer weather! 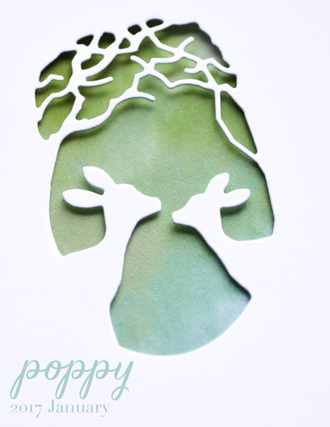 He seems to sit perfectly on the Delicate Branch Collage too. 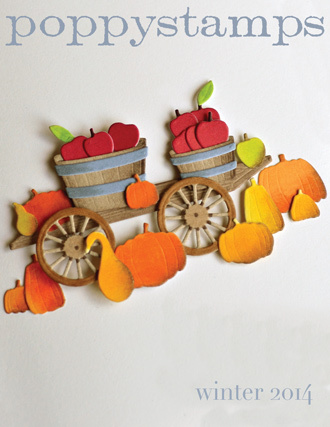 With a little bit of craft tweezer inlay paper piecing, you can bring this bird to life! 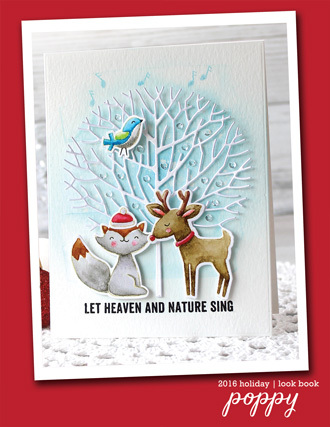 This Perched Bird Collage could be yours, and all you have to do is leave a comment to win! 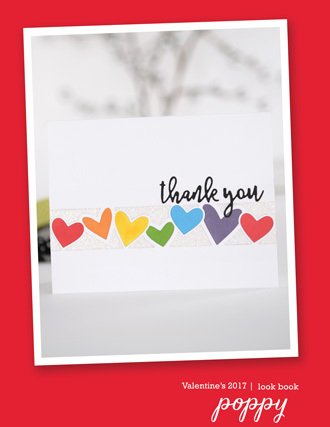 Thank you so much for joining us today, and be sure to leave a comment!